This is AdBlock: the original Chrome extension written from the ground up to be optimized for Chrome. I was inspired by the excellent Firefox "Adblock Plus" project (which is a fork of an old Firefox "Adblock" project -- confusing, I know), but I'm not related to those, nor to "Adblock Plus For Google Chrome", to which the old "AdThwart" extension was recently renamed. 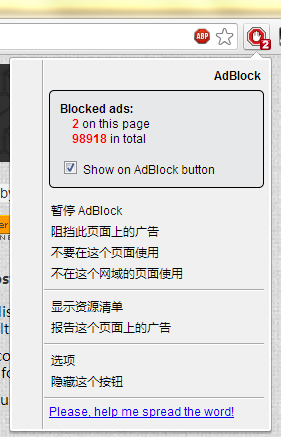 Please note that there is another extension called "AdBlock", which is not related to the AdBlock Plus movement but also works great.